The term Layer 3 switch (L3 switch) refers to a switch that also has routing features. So, instead of requiring a router external to the switch, as in Figure 10-8, the router internal to the switch performs the same routing function. The only difference between routing using a router, as in Figure 10-8, and using a Layer 3 switch lies in the internal processing. Outwardly, nothing is different. For instance, Figure 10-9 shows routing and L3 switching between two interfaces in two different VLANs. 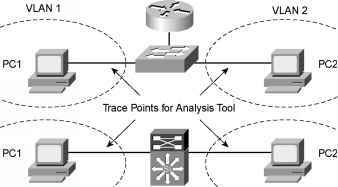 If you were to put a LAN analysis tool at the points shown in each of the two topologies and compare the packets being forwarded between the two, you would see no difference. By tracing the two similar networks at the points shown, you can confirm that there are no differences to the effect of the external router versus the L3 switch. 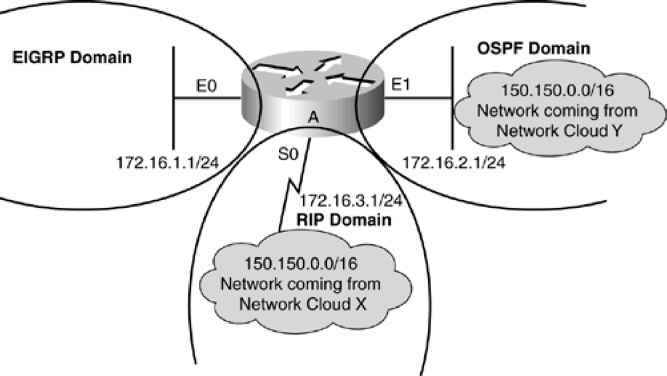 The L3 switch runs routing protocols and builds an IP routing table, and the switch makes the forwarding decision based on destination IP address. The L3 switch even discards the only Ethernet data link header and builds a new one, as described in Chapter 5, "Fundamentals of IP." The differences between the two options relates to what happens inside the L3 switch. L3 switches used specialized hardware to make the forwarding process run very fast. The switch ASICs (Application Specific Integrated Circuits) on an L3 switch have been built so that the normal, very fast L2 forwarding path can also be caused to perform the forwarding for Layer 3. In other words, the actual receipt, changing of headers, and forwarding of the packets uses the same high-speed internal processing of the L2 switch. The L3 switch also includes the software used to run other processes, such as routing protocols, which are used to populate the tables used by the specialized forwarding hardware. You do not need to know the specifics of how any one single L3 switch works internally; just know that the difference between L3 switching and routing is based on what happens inside the L3 switch.